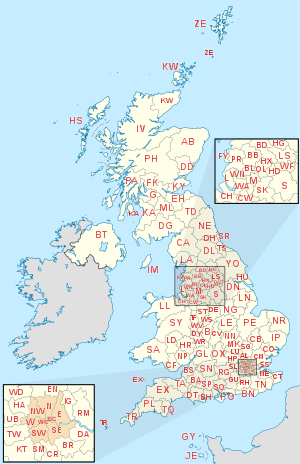 Postal codes used in the United Kingdom are known as postcodes (originally postal codes). They are alphanumeric and were adopted nationally between 11 October 1959 and 1974, having been devised by the General Post Office (Royal Mail). A full postcode is known as a "postcode unit" and designates an area with a number of addresses or a single major delivery point. The structure of a postcode is that of two alphanumeric codes, the first made up of between two and four characters, and the second made up of three characters. First, one or two letters indicate the city or region, followed by one or two digits signifying a locality/ area or neighbourhoods in that city/ region. This is followed by a space and then a number and two letters which are allocated to streets, and sides of the street. The central part of the city or region a.k.a the city centre/ town centre will have the number 1 designation alongside the city code e.g. B1 (Birmingham), LS1 (Leeds), M1 (Manchester) - all central addresses. As a general rule, a higher number indicates distance from that centre. See postcode area. Postcodes have been adopted for a wide range of purposes in addition to aiding the sorting of the mail: for calculating insurance premiums, designating destinations in route planning software and as the lowest level of aggregation in census enumeration. The boundaries of each postcode unit and within these the full address data of currently about 29 million addresses (delivery points) are stored, maintained and periodically updated in the Postcode Address File database. The initial system of named postal districts, developed in London and other large cities from 1857, evolved towards the present form: in 1917 London was split into broad numbered subdivisions, and this extended to the other cities in 1934. After the reorganisation of London in the 1960s, many parts of the city now lie outside the traditional postcode zone. This includes, but is not limited to, large parts of the "TW" "KT" "SM" "CR" "HA" and "UB" postcode areas, among a few others. As examples of the postcode system, the postcode of the University of Roehampton in London is SW15 5PU, where SW stands for south-west London, and the postcode of GCHQ is GL51 0EX, where GL signifies the postal area of Gloucester. The postal town can be a wide area and does not relate to a specific town, county or region. GL51 is one of the postcodes for the town of Cheltenham (in Gloucestershire). Theoretically, deliveries can reach their destination using the house number (or name if the house has no number) and post code alone; however, this is against Royal Mail guidelines, which request the use of a full address at all times. The London post town covers 40% of Greater London. On inception (in 1857/8) it was divided into ten postal districts: EC (East Central), WC (West Central), N, NE, E, SE, S, SW, W, and NW. The S and NE sectors were later abolished. In 1917, as a wartime measure to improve efficiency, these were subdivided with a number applied to each sub-district, with the area served directly by the district head office as "1" with the others allocated alphabetically by delivery office, leading to N2 East Finchley delivery office, N3 Finchley delivery office, N4 Finsbury Park delivery office. These divisions changed little, usually only changed for operational efficiency. Some older road signs in Hackney still indicate the North East (NE/N.E.) sector/district. Street name signs on Birdbrook Road, Great Barr, Birmingham, showing old "Birmingham 22" (top) and modern "B44" postcodes. Following the successful introduction of postal districts in London, the system was extended to other large towns and cities. Liverpool was divided into Eastern, Northern, Southern and Western districts in 1864/65, and Manchester and Salford into eight numbered districts in 1867/68. In 1917, Dublin – then still part of the United Kingdom – was divided into numbered postal districts. These continue in use in a modified form by An Post, the postal service of the Republic of Ireland. In 1923, Glasgow was divided in a similar way to London, with numbered districts preceded by a letter denoting the compass point (C, W, NW, N, E, S, SW, SE). In January 1932 the Postmaster General approved the designation of some predominantly urban areas into numbered districts. In November 1934 the Post Office announced the introduction of numbered districts (short postal codes) in "every provincial town in the United Kingdom large enough to justify it". Pamphlets were issued to each householder and business in ten areas notifying them of the number of the district in which their premises lay. The pamphlets included a map of the districts, and copies were made available at local head post offices. The public were "particularly invited" to include the district number in the address at the head of letters. A publicity campaign in the following year encouraged the use of the district numbers. The slogan for the campaign was "For speed and certainty always use a postal district number on your letters and notepaper". A poster was fixed to every pillar box in the affected areas bearing the number of the district and appealing for the public's co-operation. Every post office in the numbered district was also to display this information. Printers of Christmas cards and stationery were requested to always include district numbers in addresses, and election agents for candidates in the upcoming general election were asked to ensure they correctly addressed the 100 million items of mail they were expected to post. Businesses were issued with a free booklet containing maps and listings of the correct district number for every street in the ten areas. For example, Toxteth was Liverpool 8. A single numbering sequence was shared by Manchester and Salford: letters would be addressed to Manchester 1 or Salford 7 (lowest digits, respectively). Some Birmingham codes were sub-divided with a letter, such as Great Barr, Birmingham 22 or Birmingham 22a, as can still be seen on many older street-name signs. The Post Office experimented with electromechanical sorting machines in the late 1950s. These devices presented an envelope to an operator, who would press a button indicating which bin to sort the letter into. Postcodes were suggested to increase the efficiency of this process, by removing the need for the sorter to remember the correct sorting for as many places. In January 1959 the Post Office analysed the results of a survey on public attitudes towards the use of postal codes, choosing a town in which to experiment with codes. The envisaged format was a six-character alphanumeric code with three letters designating the geographical area and three numbers to identify the individual address. On 28 July Ernest Marples, the Postmaster General, announced that Norwich had been selected, and that each of the 150,000 private and business addresses would receive a code by October. Norwich had been selected as it already had eight automatic mail sorting machines in use. The original Norwich format consisted of "NOR" followed by a space, then a two-digit number (which, unlike the current format, could include a leading zero) and a single final letter (instead of the two final letters in the current format). In October 1965, Tony Benn as Postmaster General announced that postal coding was to be extended to the rest of the country in the next few years. On 1 May 1967 postcodes were introduced in Croydon. The many postcodes for central Croydon began with "CRO", and those of the surrounding post towns with outward codes (the characters before the space) CR2, CR3 and CR4. The uniform system of a set of three final characters, after the space, such as 0AA, known as the inward code, was adopted. This was to be the beginning of a ten-year plan, costing an estimated £24 million. Within two years it was expected that full coding would be used in Aberdeen, Belfast, Brighton, Bristol, Bromley, Cardiff, Coventry, Manchester, Newcastle upon Tyne, Newport, Reading, Sheffield, Southampton and the Western district of London. By 1967, codes had been introduced to Aberdeen, Southampton, Brighton and Derby. In 1970, codes were introduced to the London W and North Western postal districts. In December 1970 much Christmas mail was postmarked with the message "Remember to use the Postal Code", although codes were used to sort mail in only a handful of sorting offices. During 1971, occupants of addresses began to receive notification of their postcode. Asked in the House of Commons about the completion of the coding exercise, the Minister of State for Posts and Telecommunications (whose role superseded that of Postmaster General in 1969), Sir John Eden, stated that it was expected to be completed during 1972. The scheme was finalised in 1974 when Norwich was completely re-coded but the scheme tested in Croydon was sufficiently close to the final design for it to be retained, with CRO standardised as CR0 (district zero), thus removing the need to create a CR1 district. A quirk remained: the central Newport area was allocated NPT, at a similar time to Croydon becoming CRO, and surrounding areas were, as today, allocated NP1–NP8. NPT lasted until the end of 1984 when it was recoded NP9. Girobank's GIR 0AA, the last domestic postcode with a fully alphabetical outward code, no longer exists in the Royal Mail's PAF system, but remains in active use by the bank's owners, currently Santander UK. When the national postcode system was introduced, many existing postal districts were incorporated into it, so that postcodes in Toxteth (Liverpool 8) start with L8. The districts in both Manchester and Salford gained M postcodes, so Salford 7 became M7 and so on (and similarly in Brighton and Hove, both using the prefix BN). The old coding lives on in a small number of street signs with (for example) "Salford 7" at the bottom. In other cases, the district numbers were replaced with unrelated numbers. In Glasgow many of its G-prefixed numbers are not used as C1 became G1, W1 became G11, N1 became G21, E1 became G31, S1 became G41, SW1 became G51, and so on. In London (as postally defined) 1917-created postal districts are mapped unchanged to those of today but its much enlarged administrative area, Greater London was created in April 1965. From that month the remaining 60% of Greater London's area has postcodes referring to 13 other post towns. Additionally, there were too few postcodes to adequately cover districts in central London (particularly in the WC and EC areas), so these were subdivided with a letter suffix rather than being split into new numbered districts, so as to retain the familiar codes. Prior to 1 April 2010 the Royal Mail licensed use of the postcode database for a charge of about £4000 per year. Following a campaign and a government consultation in 2009 the Ordnance Survey released Code-Point Open, detailing each current postcode in Great Britain together with a geo-code for re-use free of charge under an attribution-only licence Open Government Licence as part of OS OpenData. The Office for National Statistics (ONS Geography) maintains and publishes a series of freely available, downloadable postcode products that link all current and terminated UK postcodes to a range of administrative, health, statistical and other geographies using the Code-Point Open grid reference. The postcodes are alphanumeric, and are variable in length: ranging from six to eight characters (including a space) long. Each post code is divided into two parts separated by a single space: the outward code and the inward code respectively. The outward code includes the postcode area and the postcode district, respectively. The inward code includes the postcode sector and the postcode unit respectively. Examples of postcodes include "SW1W 0NY", "PO16 7GZ", "GU16 7HF", or "L1 8JQ". The outward code is the part of the postcode before the single space in the middle. It is between two and four characters long. Examples of outward codes include "L1", "W1A", "RH1", "RH10" or "SE1P". A few outward codes are non-geographic, not divulging where mail is to be sent. The postcode area is part of the outward code. The postcode area is either one or two characters long and is all letters. Examples of postcode areas include "L" for Liverpool, "RH" for Redhill and "EH" for Edinburgh. A postal area may cover a wide area, for example "RH" covers north Sussex, and "BT" (Belfast) covers the whole of Northern Ireland. The postcode district is made of one or two digits or a digit followed by a letter. The outward code is between two and four characters long. Examples include "W1A", "RH1", "RH10" or "SE1P". The inward code is the part of the postcode after the single space in the middle. It is three characters long. The inward code assists in the delivery of post within a postal district. Examples of inward codes include "0NY", "7GZ", "7HF", or "8JQ". The postcode sector is made up of single digit. The postcode unit is two characters added to the end of the postcode sector. postcode unit generally represents a street, part of a street, a single address, a group of properties, a single property, a sub-section of the property, an individual organisation or (for instance Driver and Vehicle Licensing Agency) a subsection of the organisation. The level of discrimination is often based on the amount of mail received by the premises or business. Examples of postcode units include "SW1W 0NY", "PO16 7GZ", "GU16 7HF", or "L1 8JQ". Areas with only single-digit districts: BR, FY, HA, HD, HG, HR, HS, HX, JE, LD, SM, SR, WC, WN, ZE (although WC is always subdivided by a further letter, e.g. WC1A). Areas with only double-digit districts: AB, LL, SO. Areas with a district '0' (zero): BL, BS, CM, CR, FY, HA, PR, SL, SS (BS is the only area to have both a district 0 and a district 10). The following central London single-digit districts have been further divided by inserting a letter after the digit and before the space: EC1–EC4 (but not EC50), SW1, W1, WC1, WC2, and part of E1 (E1W), N1 (N1C and N1P), NW1 (NW1W) and SE1 (SE1P). The letters QVX are not used in the first position. The letters IJZ are not used in the second position. The only letters to appear in the third position are ABCDEFGHJKPSTUW when the structure starts with A9A. The only letters to appear in the fourth position are ABEHMNPRVWXY when the structure starts with AA9A. The final two letters do not use the letters CIKMOV, so as not to resemble digits or each other when hand-written. Post code sectors are one of ten digits: 0 to 9 with 0 only used once 9 has been used in a post town, save for Croydon and Newport (see above). A postcode can be validated against a table of all 1.7 million postcodes in Code-Point Open. The full delivery address including postcode can be validated against the Royal Mail Postcode Address File (PAF) which lists 29 million valid delivery addresses, constituting most (but not all) addresses in the UK. All, or part, of one or more postcode districts are grouped into post towns. Larger post towns may use more than one postcode district, for example Crawley uses RH10 and RH11. In a minority of cases a single number can cover two post towns – for example, the WN8 district includes Wigan and Skelmersdale post towns. The Channel Islands and the Isle of Man established their own postal administrations separate from the UK in 1969. Despite this they adopted the UK format postcodes, Guernsey in 1993 using GY, the Isle of Man the same year using IM, and Jersey in 1994 using JE. The independent jurisdiction of Sark was assigned a unique postcode prefix GY10 in 2011 to differentiate it from Alderney. The CEO of Guernsey Post, Boley Smillie said "this has been a long time coming" and "... Sark should have had its own identity back then [when postcodes were adopted in 1993]". These were introduced because mail was often sent to the wrong place, e.g., for St Helena to St Helens, Merseyside and Ascension Island to Asunción, Paraguay, and many online companies would not accept addresses without a postcode. Mail from the UK continues to be treated as international, not inland, and sufficient postage must be used. Royal Mail's Heathrow centre collects all live underpaid mail for surcharging, and there is a reciprocal arrangement with postal services around the world to collect. An agreed payment based on volumes is made, year on year. Other forms of postage are collected at local mail centres, but Heathrow collects those that still get forwarded to them. Bermuda, the UK's most populous remaining overseas territory, has developed its own postcode system, with unique postcodes for street and PO Box addresses, as have the Cayman Islands, Montserrat and the British Virgin Islands. Montserrat recently introduced postal codes, and a system has been under consideration in Gibraltar, and the code GX11 1AA has been introduced as the generic postcode for the territory. Postcodes are not used in the Turks and Caicos Islands and the TKCA 1ZZ designation is generally unknown. British Overseas Territories typically have a local or UK government postal system operator (see List of postal entities), even if a postal code is assigned by Royal Mail for internal UK routing. The British Forces Post Office (BFPO) provides a postal service to HM Forces separate from that provided by Royal Mail in the United Kingdom, with BFPO addresses used for the delivery of mail in the UK and around the world. BFPO codes such as "BFPO 801" serve the same function as postal codes for civilian addresses, with the last line of the address consisting of "BFPO" followed a space and a number of 1 to 4 digits. For consistency with the format of other UK addresses, in 2012 BFPO and Royal Mail jointly introduced an optional alternative postcode format for BFPO addresses, using the new non-geographic postcode area "BF" and the notional post town "BFPO". Each BFPO number is assigned to a postcode in the standard UK format, beginning "BF1". The database was released commercially in March 2012 as part of the Royal Mail Postal Address File (PAF). A postcode is not required if the traditional "BFPO nnnn" format is used. Most postcodes apply to a geographic area but some are used only for routing and cannot be used for navigation or distance-finding. They are often used for direct marketing and PO boxes. Some postcode sectors or districts are set aside solely for non-geographic postcodes, including EC50, BS98, BT58, BX1-BX9, IM99, M60, N1P, NE99, SA99, SW99 and JE4. Girobank's headquarters in Bootle used the non-geographic postcode GIR 0AA. Non-geographic postcode area BX is used solely for non-geographic addresses, with codes independent of the location of the recipient. See next paragraph. There is also a special postcode for letters to Santa/Father Christmas, XM4 5HQ. Postcodes are allocated by Royal Mail's Address Management Unit and cannot be purchased or specified by the recipient. However, Royal Mail sometimes assigns semi-mnemonic postcodes to high-profile organisations. The postcode printed on Business Reply envelopes (which do not require a stamp) often ends with the letters BR. Postcodes are used to sort letters to their destination either manually, where sorters use labelled frames, or increasingly with letter-coding systems, where machines assist in sorting. A variation of automated sorting uses optical character recognition (OCR) to read printed postcodes, best suited to mail that uses a standard layout and addressing format. A long string of "faced" letters (i.e. turned to allow the address to be read) is presented to a keyboard operator at a coding desk, who types the postcodes onto the envelopes in coloured phosphor dots. The associated machine uses the outward codes in these dots to direct bundles of letters into the correct bags for specific delivery offices. With a machine knowledge of the specific addresses handled by each postal walk at each office, the bundles can be further sorted using the dots of the inward sorting code so that each delivery round receives only its own letters. This feature depends upon whether or not it is cost effective to second-sort outward letters, and tends to be used only at main sorting offices where high volumes are handled. When postcodes are incomplete or missing, the operator reads the post town name and inserts a code sufficient for outward sorting to the post town where others can further direct it. The mail bags of letter bundles are sent by road, air or train, and eventually by road to the delivery office. At the delivery office the mail that is handled manually is inward sorted to the postal walk that will deliver it, and it is then "set in", sorted into the walk order that allows the deliverer the most convenient progress in the round. The latter process is now being automated, as the rollout of walk sequencing machines continues. Integrated Mail Processors (IMPs) read the postcode on the item and translate it into two phosphorous barcodes, unique to the inward and outward parts of the postcode, which the machines subsequently print and read, to sort the mail to the correct outward postcode. Letters may also be sequentially sorted by a Compact Sequence Sorter (CSS) reading the outward postcode, in the order that a walking postman/woman will deliver, door to door. On such items the top phosphorous barcode is the inward part of the code, the bottom is the outward. IMPs can also read RM4SCC items, as used in Cleanmail, a different format to the above. A newer system of five-digit codes called Mailsort was designed for users who send "a minimum of 4,000 letter-sized items". It encodes the outward part of the postcode in a way that is useful for mail routing, so that a particular range of Mailsort codes goes on a particular plane or lorry. Mailsort users are supplied with a database to allow them to convert from postcodes to Mailsort codes and receive a discount if they deliver mail to the post office split up by Mailsort code. Users providing outgoing mail sorted by postcode receive no such incentive since postcode areas and districts are assigned using permanent mnemonics, and do not therefore assist with grouping items together into operationally significant blocks. Walksort[clarification needed] was discontinued in May 2012. There are approximately 1.7 million postcodes in the United Kingdom (including the Channel Islands and the Isle of Man). Each postcode is divided by a space into two parts. As mentioned above, the first part is known as a postcode district. Postcode districts with the same one or two letter prefixes are grouped into postcode areas. The second part of a postcode begins with a single digit which indicates the postcode sector within each district. Postcode areas are also divided into several post towns, which predate the introduction of postcodes, with the London post town uniquely covering more than one postcode area. As of June 2016, there are 124 postcode areas, 2,987 postcode districts, 11,192 postcode sectors, and 1,500 post towns. Addresses receiving large volumes of mail are each assigned separate "large user" postcodes. But most postcodes are shared by several neighbouring properties, typically covering about 15 addresses. There are also significant numbers of discontinued (terminated) codes. Each month some 2,750 postcodes are created and 2,500 terminated. The Address Management Unit of Royal Mail maintains an official database of UK postal addresses and postcodes on its Postcode Address File (PAF), which is made available under licence for a fee regulated by Ofcom. The PAF is commercially licenseable and is often incorporated in address management software packages. The capabilities of such packages allow most addresses to be constructed solely from the postcode and house number. By including the map references of postcodes in the address database, the postcode can be used to pinpoint a postcode area on a map. PAF is updated daily. On its poweredbypaf.com website, Royal Mail publishes summary information about major changes to postcode sectors and postal localities (including post towns). Individual postcodes or postal addresses can be found using Royal Mail's Postcode and Address Finder website, but this is limited to 50 free searches per user per day. A complete list of all current Great Britain postcodes, known as Code-Point Open, has been made available online (since 1 April 2010) by Ordnance Survey. Under the government's OS OpenData initiative, it is available for re-use without charge under an attribution-only licence. The Code-Point Open list includes median coordinates for each postcode but excludes postcodes in Northern Ireland and the Crown dependencies. Unlike the PAF products provided by Royal Mail, the Code-Point Open list does not include postal address text. The Office For National Statistics also produces postcode directories, under similar licence terms to the OS product. Both the ONSPD and NSPL contain Northern Ireland postcodes, with centroid coordinates in the OSI grid as opposed to the OSGB grid, although Northern Ireland postcodes are subject to a more restrictive licence permitting internal business use only. Postcodes for the Crown Dependences are also included, without co-ordinates. A further difference is that non-current postcodes, and dates of introduction and withdrawal of postcodes are included. Finding the nearest branch of an organisation to a given address. A computer program uses the postcodes of the target address and the branches to list the closest branches in order of distance as the crow flies (or, if used in conjunction with streetmap software, by road distance). This can be used by companies to inform potential customers where to go, by job centres to find jobs for job-seekers, to alert people of town planning applications in their area, and a great many other applications. With satellite navigation systems, to navigate to an address by street number and postcode. By life insurance companies and pension funds to assess longevity for pricing and reserving. By other types of insurance companies to assess premiums for motoring/business/domestic policy premiums. To determine catchment areas for school places or doctors' surgeries. The phrase "postcode lottery" refers to the variation in the availability of services by region, though not always because of postcodes. For these and related reasons, postcodes in some areas have become indicators of social status. Some residents have campaigned to change their postcode to associate themselves with a more desirable area, to disassociate with a poorer area or to be associated with an area with a lower cost of living. In all these cases Royal Mail has said that there is "virtually no hope" of changing the postcode, referring to their policy of changing postcodes only to match changes in their operations. Postcode areas rarely align with local government boundaries, and a few straddle England's borders with Wales and Scotland. This has led to British Sky Broadcasting subscribers receiving the wrong BBC and ITV regions, and newly licensed radio amateurs being given incorrect call signs. ^ a b c Royal Mail (October 2004). Address Management Guide (4 ed.). Royal Mail Group. ^ "A short history of the postcode". The Independent. 1 January 2005. Retrieved 3 October 2009. ^ "Numbered P.O. Districts In Country Towns. Aid To Accurate Delivery". The Times. 20 November 1934. p. 14. ^ a b "Postal District Numbers Appeal For Use In Addresses". The Times. 29 October 1935. p. 14. ^ "1951 will, using address in "Birmingham 22a"". Jacomb.com. Archived from the original on 8 February 2007. Retrieved 1 September 2010. ^ Examples of Norwich NOR postcodes in the old format: "NOR 03Z", "NOR 66F", "NOR 83B", "NOR 05S". "No. 45542". The London Gazette. 13 December 1971. p. 13658. ^ "Five lesser-spotted things Tony Benn gave the UK". BBC News. BBC. 14 March 2014. Retrieved 13 May 2014. ^ Newport Borough Council (17 December 1984). "Borough of Newport (Kingsway) (Business Parking Places) Order 1985" (PDF). The London Gazette (No. 49959). HMSO. p. 17064. Retrieved 5 October 2009. ^ a b Charles Arthur (10 October 2009). "newspaper article on postcodes". Guardian. Retrieved 1 September 2010. ^ "DCLG: Policy options for geographic information from Ordnance Survey: Consultation" (in Chinese). Communities.gov.uk. 23 December 2009. Archived from the original on 30 December 2009. Retrieved 1 September 2010. ^ a b c d "Postcodes & Addresses Explained". Royal Mail. Archived from the original on 16 July 2012. Retrieved 28 June 2014. ^ Michael Tandy. "Falsehoods programmers believe about addresses". Mjt.me.uk. Retrieved 8 October 2017. ^ Address Management Guide (5th ed.). Royal Mail Group plc. March 2007. Retrieved 25 October 2012. ^ Written Answer , House of Commons Hansard, 17 December 2002, column 739W. ^ "Sark gets own GY10 postcode after split from Alderney". BBC News. 7 January 2011. Retrieved 6 August 2017. ^ First postcode for remote UK isle. BBC News. 7 August 2005. ^ Turks and Caicos Islands. Bureau International UPU. ^ "Bermuda Post Office". bpo.bm. Retrieved 31 July 2017. ^ "Cayman Islands Postal Service Postcode Finder". Caymanpost.gov.ky. Retrieved 1 September 2010. ^ "British Virgin Islands to get its own postal code". Caribbeannetnews.com. 29 September 2006. Archived from the original on 4 October 2009. Retrieved 1 September 2010. ^ "A QUICK GUIDE TO USING POSTCODE IN YOUR MAIL" (PDF). Gov.ms. Retrieved 8 October 2017. ^ Government set to introduce post codes. Gibraltar News. 30 June 2006. ^ "Universal Postal Union document on Gibraltar" (PDF). Upu.int. Retrieved 8 October 2017. ^ "A better deal for overseas personnel". Royal Air Force. 23 April 2012. Retrieved 30 July 2012. ^ "BFPO Indicator List" (PDF). Ministry of Defence. April 2012. Retrieved 30 July 2012. ^ Royal Mail (12 May 2013). "Christmas letters to Santa". Retrieved 5 December 2013. ^ Stamp, Gavin (31 July 2012). "Postcode lottery? How EU entered historic Conservative address". BBC News. Retrieved 31 July 2012. ^ See Royal Mail's online Postcode Finder for full postal addresses. ^ "Making a complaint". TV Licensing. Archived from the original on 5 May 2012. Retrieved 31 July 2012. ^ "Lloyds TSB – Frequently asked questions". Lloydstsb.com. Archived from the original on 16 June 2012. Retrieved 31 July 2012. ^ "Terms and Conditions – Keycard" (PDF). bankofscotlandbusiness.co.uk. December 2011. Archived from the original (PDF) on 6 November 2012. Retrieved 31 July 2012. ^ "Investor and Advisors Contacts". Lombard Medical. Retrieved 31 July 2012. ^ "How to complete your VAT Return". HM Revenue and Customs. Retrieved 31 July 2012. ^ "Media Contacts". ExCel London. Archived from the original on 31 July 2012. Retrieved 31 July 2012. ^ "Contact Us". Scottish.parliament.uk. Retrieved 31 July 2012. ^ "No. 58985". The London Gazette. 20 February 2009. p. 3105. ^ "BBC Genome: World Snooker (1989)". BBC. Retrieved 9 September 2015. ^ "2: The organisation of the Post Office and its letter post operations". The Post Office Letter Post Service: a report on the letter post service of the Post Office in the Head Post Office areas of Glasgow, Belfast and Cardiff and in the numbered London postal districts (PDF). Competition Commission. 1984. pp. 19–20. Archived from the original (PDF) on 19 January 2012. Retrieved 28 June 2014. ^ "A guide for letter envelope design and clear addressing – How to get it right" (PDF). Royal Mail. August 2012. Archived from the original (PDF) on 31 October 2014. Retrieved 28 June 2014. ^ "£120 Million Further Investment In Royal Mail Modernisation". Royal Mail. 21 July 2009. Archived from the original on 13 March 2016. Retrieved 28 June 2014. ^ "Modernisation – Transforming how we sort your mail". Royal Mail. Archived from the original on 28 June 2014. Retrieved 28 June 2014. We’re introducing new machines so postmen and women no longer need to sort most of their delivery manually. They will receive mail in the order of their route, so they can get straight out on delivery. ^ "Walksort". Royal Mail. Archived from the original on 22 February 2014. Retrieved 28 June 2014. ^ a b "Postcode Address File statistics" (PDF). Royal Mail. June 2016. Archived from the original (PDF) on 7 April 2017. Retrieved 21 June 2016. ^ Edwards, Alex (23 January 2013). "How often do postcodes change?". Listmark. Archived from the original on 16 October 2015. Retrieved 28 June 2014. ^ "Licences". Office for National Statistics. Retrieved 31 July 2017. ^ "England | 'Snobs' want to slough off postcode". BBC News. 17 January 2003. Retrieved 4 January 2010. ^ "Cracking The Codes Not Easy (from This Is Local London)". Thisislocallondon.co.uk. 12 March 2002. Archived from the original on 26 May 2008. Retrieved 4 January 2010. ^ Scrivens, Louise (5 April 2005). "UK | England | London | The power of the postcode". BBC News. Retrieved 4 January 2010.